About, Auburn, CA | Sterling P Holloway Inc.
Sterling P. Holloway Inc. in Auburn, CA offers many years of experience in our industry. Founded by Sterling P. Holloway III in 1970, we have been serving Northern CA and Northwestern NV (including Reno and Carson City) residents and businesses for more than 45 years with quality services. Our quality is always guaranteed, and we provide services at affordable prices. Count on us to handle all of your projects with precision and care. We offer emergency response services that are timely and effective, or we can schedule your project for a time that is most convenient to you. Our business was inducted into the Better Business Bureau on October 17, 2013, and we carry CA State Contractor’s License 382173 and Nevada License 0028539, with Classifications A, ASB, C-12, C-21, and C- 22. We’re also DOSH Certified. 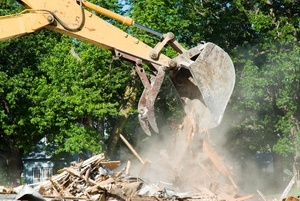 You can rely on our small family-owned and operated business to provide you with the demolition or clearing services that you would expect from someone with more than 4 decades in the industry. Our goal is your complete satisfaction. Reach out to us today at 530-878-1800 to learn more or to schedule a project quote.